Truth be told, we all love a new pair of jeans that fit well. They make us happy, they can help build our confidence, and they’re fun to parade around in. With this in mind, marketers have convinced us that we need a new wardrobe every season, and fast fashion companies have provided us with clothes that have a one year at most expiry date. Sadly though, our passion for fashion is quickly destroying the planet, with foaming rivers in Bangalore, unnaturally blue water sources in Xintang, China, and American landfills filled to the brim with lightly used clothing. The chemical leakage of poorly made denim is hazardous to say the least. Dyes from denim leach out, with chemical compounds like mercury, cadmium and lead swimming around in otherwise safe waters. Most of us don’t think of how our favourite pair of jeans have been made and what environmental effects they’ve caused, and this is largely due to the fact that most denim is made in developing nations. With pH levels in water sources near factories far past regulatory standards, with metals hundreds of times higher than their safety limit, and with silicosis and lung cancer a real threat to factory employees, it’s obvious something needs to change. Additionally, landfills in North America are filling up faster than they can handle, with 13.6 million tons of clothing being thrown away each year. While this is extremely wasteful, it’s also hazardous to the environment as cheaply made clothing leaches chemicals into the earth it’s thrown in, causing reactions. Clothes made from synthetic fibres like nylon, polyester, or acrylic are oil-based fabrics. These chemicals seep into our water, plants, earth, atmosphere, and eventually, our bodies. And while we can blame fast fashion and magazines for creating this beast, ultimately it comes down to us to make a change in our buying habits – a change that will in earnest, get the attention of the fashion industry. With millennials being amongst the savviest buyers and consumers the world has seen, questions are being asked, and better is being demanded. Companies are listening. The options for sustainable denim are becoming easier to find, and more plentiful. The blue we love is going green, and we’re damn happy about it. 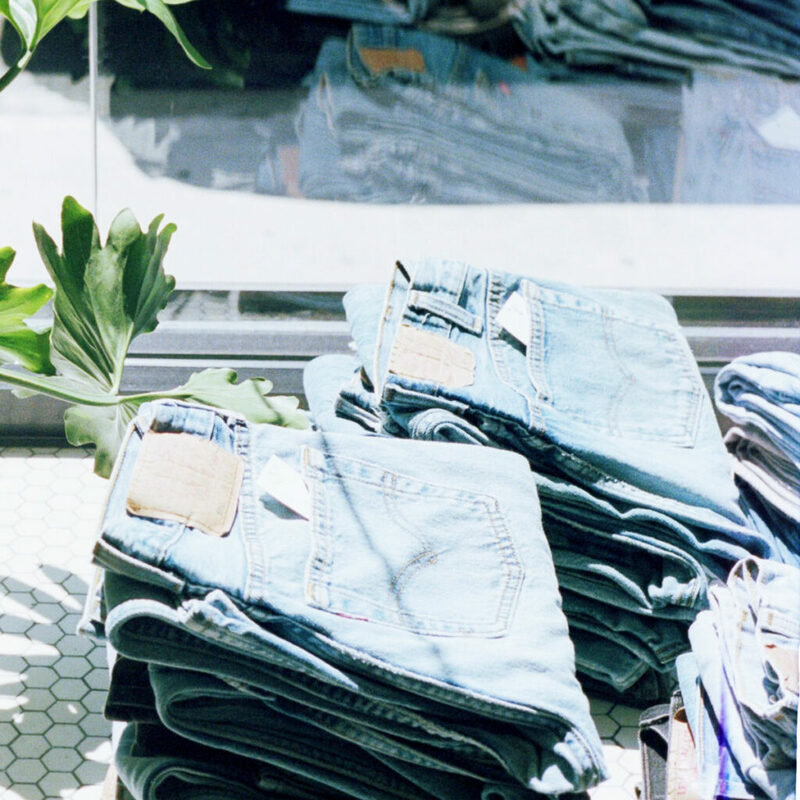 Check out these companies that just get it when it comes to providing eco-friendly denim. Having recently released their line of jeans, Everlane took its time with this as they wanted to make sure they were working with the most sustainable denim manufacturers ever. Their denim line is made at a manufacturer called Saitex, where their LEED-certified facility recycles 98% of its water. Most manufacturers use around 1500 litres of water to make their denim, while Saitex uses just 0.4 litres, AND the recycled water is so clean, it’s drinkable. Saitex also relies on alternative energy sources, uses air-dry methods to dry their denim, and repurposes any fabric by-products, significantly reducing waste. AG Jeans uses sustainable fibres to make their denim, and their water consumption is less than 50% of what other brands might use. Partnered with charity: water, they help bring clean and safe drinking water to people in developing nations. Fabric scraps from runoffs are collected weekly for recycling, and often go towards car and home insulation. They’ve also been able to implement heat saving equipment that allows them to actually recycle heat from dryers, reducing their energy consumption by 40%. A service started by two twin sisters who found their passion of up-cycling vintage clothing, The Vintage Twin reworks pre-owned denim into stylish, modern and unique pieces. Aiming to reduce fashion-associated waste, vintage denim is selected, professionally laundered and then cut and sewn into flattering and modern shapes. Clothing is given another life, and you can feel great about rescuing a pair of jeans otherwise destined for a landfill. Forage and Sustain is an online platform that approaches all things related to sustainable and conscious living with a fresh perspective. Founder, Arti Jalan, creatively explores a myriad of topics that affect us in our lives such as self-care & wellness, conscious travel, slow living and ethical fashion. She educates us on how to shift our focus to have a more positive impact in these areas, and encourages us to become agents of social change.